I’m not sure what the different tabs do, what templates are, etc. Help! The tabs are designed so that the user basically works left to right; for more detailed information, please review the online help which includes “Getting Started” information, screenshots, etc. The online help will also automatically come up when the program is first launched. Is there an iOS version of this app for my iPhone or iPad? Not at this time. Travel PackList is currently a Mac OS app only. However, if you print your PackList to PDF (see next FAQ) and store it using an online storage service such as DropBox, you can view your PackList on different types of devices. I don’t have a printer – how do I access and use my Packlist? Does Travel PackList integrate with the “cloud”? 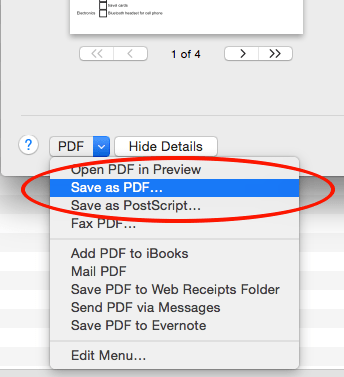 Not directly, but you can create PDF and use cloud storage to access your PackLists (see above). When I make changes to my trip template after I’ve generated a trip, the changes have no effect on trips I’ve already generated – is that “normal”? Sometimes I add items to a specific trip and realize I want them to be available in the general item list. Can I do that? Yes. 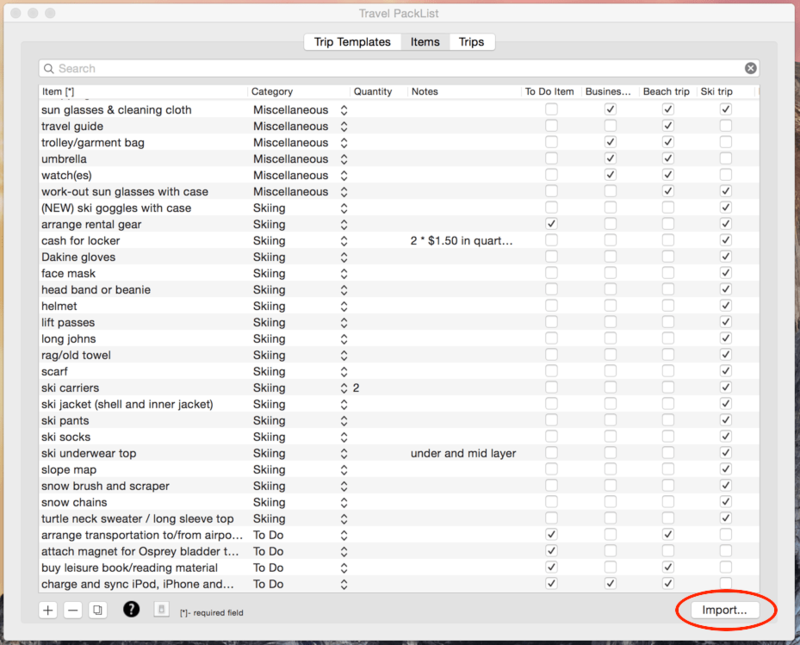 With version 1.0.4, a “copy to item list” icon/button was added to the trip item window. You can select one or multiple items within a trip and then, through use of that button, copy them “up” to the general item list. Once complete, please remember to then add those items to the trip templates where they apply. Yes, you can find a sample CSV file here that you can import and in the Items tab then modify based on your own preferences. When I try to view the online help, I’m getting a message “Help isn’t available”!? Travel PackList is currently not localized for a language other than English. If you live in a non-English-speaking country, your Mac’s language settings may prevent the help from being accessible. Please try this: go to your System Preferences and select “Language and Region”. If English does not appear under “Preferred Languages” on the left, please add it and relaunch Travel PackList.